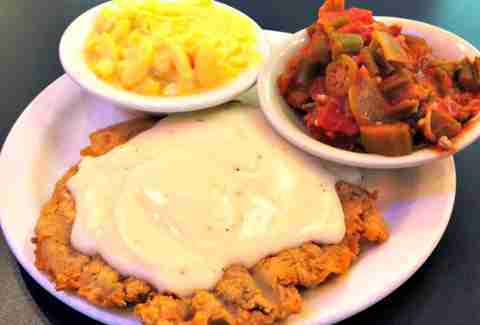 Texans: we’re absolute whores for a great chicken-fried steak. There’s just something about a tenderized cut of red meat (traditionally cube steak) that’s battered, floured, fried, and served under a river of cream gravy that gets us as state-patriotic as a tour of the Capitol Building. 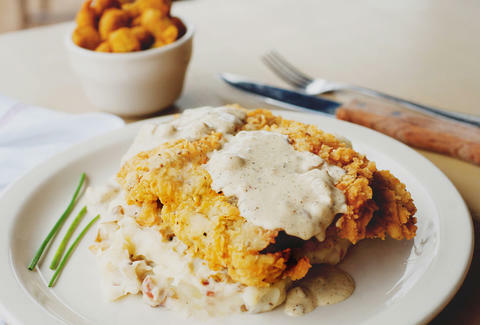 In Dallas, if you know where to look, you can find the cream (gravy) of the crop of CFS just waiting to enter your face -- from classic preparations passed down for generations, to modern twists with different cuts of meat. So slap on a bib, hop in the car, and get to sampling. As if the classic CFS isn’t already a work of art, this Oak Cliff stalwart loads Mexican and (extra) Southern influences onto it via bacon-braised green beans and peppery poblano gravy. With a dollop of buttermilk mashed potatoes to round out the decadence, this plate is ready to attack. 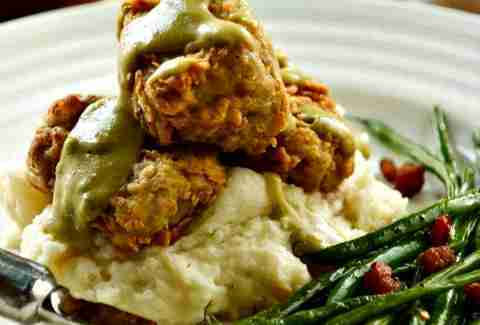 Leave it to a celebrity chef like Tim Love to go all eclectic on the chicken-fried steak. His take on it subs out mashed potatoes for a cauliflower purée and cream sauce for wild mushroom gravy. An arugula and pickled pepper salad adds some zip to the plate, as well as some tongue-twister action. This family-owned operation delivers simple, down-home CFS, served in blue plate-special, meat-and-three fashion (a mammoth double-sized serving comes with two sides). So, if the hand-battered beef itself doesn’t test the limits of your belt, sides like okra & tomatoes, mac & cheese, buttered corn, and broccoli & cheese should do the trick. Chef Jon Stevens’ modern American cuisine showplace gives the traditional CFS a brunchy update that’s also a play on chicken & waffles. Ribeye is the beef cut of choice here, and it arrives with herb waffles, all under chorizo gravy and poached eggs. If weather permits, sit on the patio and watch bedeviled Bishop Arts visitors try to find parking across the street. 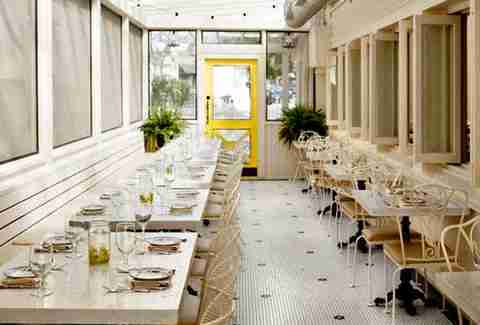 Chicken-fried steak is about as naughty as you can get, calorically, but so-named Naughty Chef Blythe Beck turns up the culinary sinfulness at this Trinity Groves permanent pop-up. She fries a ribeye and sets it over "naughty" creamed corn and braised mustard greens, then douses the whole affair in bacon red-eye gravy. Not that naughty by nature? The menu offers a small portion for the weak-willed. Chef Beck and her CFS will only be at Kitchen LTO until the end of the month (when the next rotation comes in), so be sure to get it soon! Ribeyes seem to be the favored fancy-cut for chicken-frying, but at this den of Southern cookery, the flat-iron steak gets all the love, alongside cream gravy and whipped potatoes. Not to be missed are fresh and seasonal selections from the craft cocktail menu and a scratch-made slice of pie for dessert. This Irving barbecue spot specializes in all manner of smoked meats and devised the bright idea to throw some of it in the fryer. 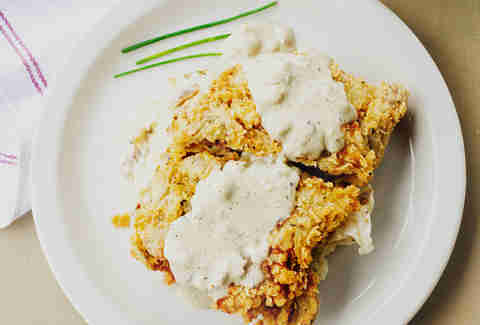 The resulting smoked chicken-fried steak is layered and pleasantly unusual, and, best of all, it unites two of Texas’ best dining treats in one dish. Before the slab of meat and the bacon mashed potatoes pull you into a food coma, order one or more beers off the extensive craft brew menu. The CFS deep in the heart of Ellum has long been hailed as one of the city’s best, and not just for its sheer size (roughly as big as your face). 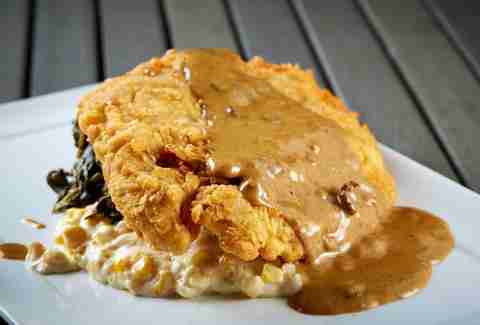 It always arrives sizzling hot, with a near-greaseless coating and a straightforward, grandma-reminiscent cream gravy. Perhaps it’s not hyperbole, then, that the menu refers to it as the "world’s best." 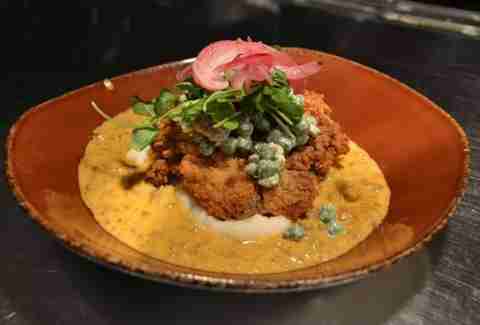 Star chef Stephan Pyles’ lunchtime take on the chicken-fried steak has it crowning a bed of mashed potatoes in a (non-swimmable) moat of chorizo gravy. 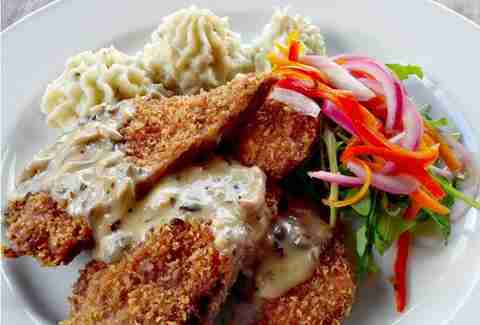 For dinner, chicken-fried buffalo gets the spotlight, with potatoes and a pea salad. The only thing that could possibly steal your attention from the plate is the Modern Star Canyon Margarita, a prickly pear-based frozen drink brought to life tableside with liquid nitrogen. While this SMU-adjacent spot that looks like a parked Airstream trailer is famous for its fried chicken, the chicken-fried steak deserves equal amounts of glory. It shares the same light, crumbly coating as its poultry counterpart and comes in small and large portions to satisfy all appetites. The luxuriously creamy mashed potatoes are a must, but you won't go wrong with candied yams or bacon-dotted green beans. 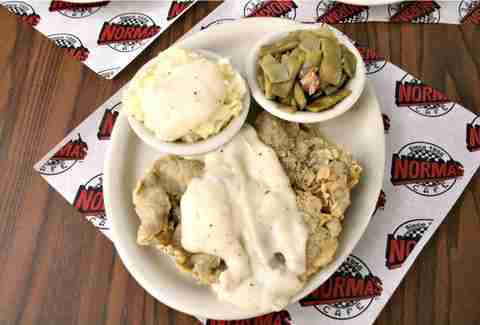 A neighborhood veteran of more than 50 years, Norma’s has practically perfected the art of the CFS. It’s giant, beautifully seasoned, and as no-frills and honest-to-goodness delicious as it gets. The country breakfast of chicken-fried steak (or chicken), eggs, hash browns, and toast is the breakfast you never knew you wanted to eat every damn day.